A Foreign Office minister mocked the Argentinian government’s 50-peso banknote, suggesting it was worthless both in terms of currency and political value. 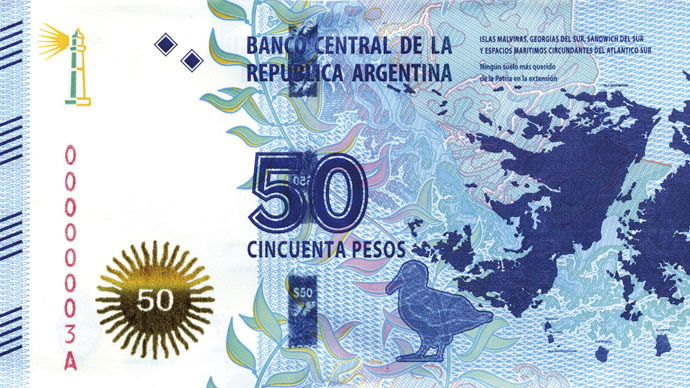 The colorful new banknote features the archipelago of the Islas Malvinas, as they are known in Argentina, on the front. On the reverse side is an image of Antonio Rivero, the Argentinian rebel leader who led an 1833 uprising in an effort to reclaim the islands from the British. Rivero, who is revered as a folk hero in the South American country, is pictured on horseback waving an Argentinian flag. The Falkland Islands have long been a source of tension between Britain and Argentina. A British territory since 1833, Argentina has always claimed the archipelago as its own after claiming it from Spain in the 1800s. Argentina attempted to seize the Falklands in 1982, sparking the two-month long Falklands War in which 649 Argentinian servicemen and 255 British were killed. The country continues to claim the Falklands, despite the island’s residents voting overwhelmingly in favor of remaining a British Overseas Territory in a 2013 referendum. Hugo Swire, a minister of state for the British Foreign Office, derided the introduction of the note. “And I think it probably has the equivalent political value,” he added.